Writing the code that interacts with the database. 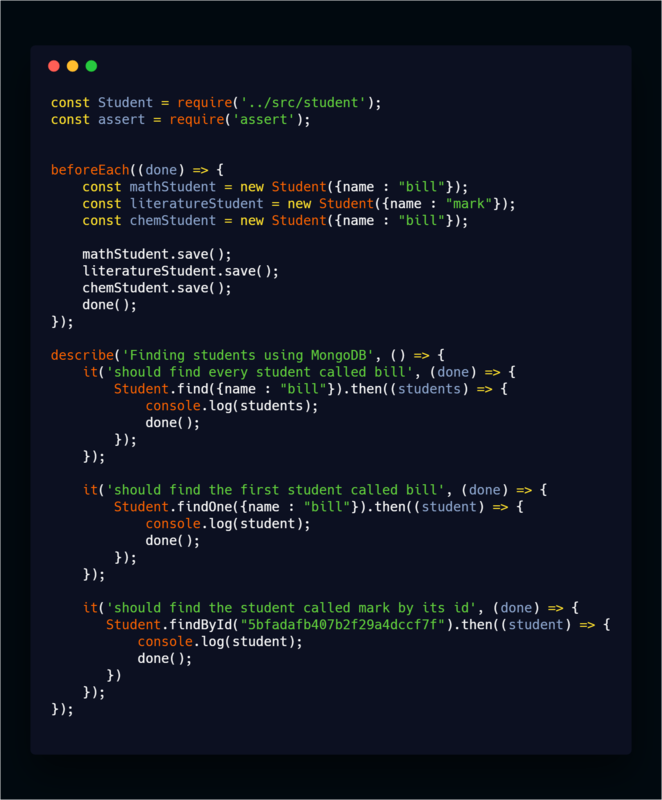 Writing tests using Mocha to test that everything went well. The first type of queries we are going to explore are reading queries. These are necessary queries that you will write whenever you will want to retrieve some data from your database. 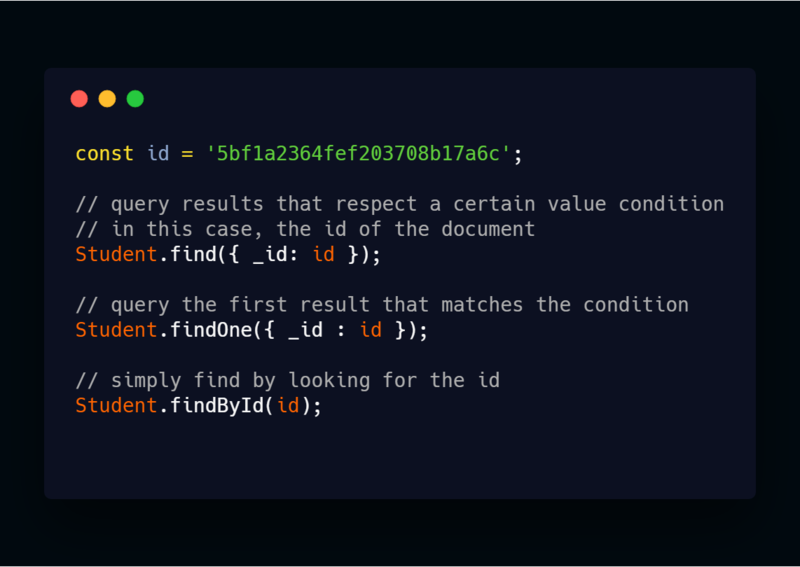 Since I’m gonna create a showcase of the various different queries you can write, my advice for you is to create a playground folder with a playground.js file. In this way, you will be able to execute and play around with the code without corrupting the rest of your project. As you may remember from the latest article I’ve written, we should now have a single document into our database representing a student called Mark. We will play around with that, but first, let’s copy its id in order to have a unique way to identify it. Before analyzing this step by step. I would like to point out to a couple of things. First, for constancy purposes, I have decided to use the _id property for each query and second, this id has been copied from the database as explained earlier. 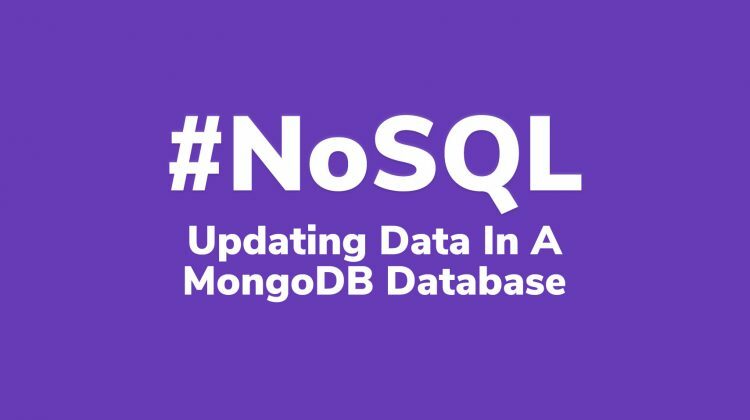 Don’t try to copy this id since its unique for my data and it won’t reflect the data that are sitting inside of your localhost database. Also, notice how like for other operations used in previous articles, the Student model provides us with useful operations for performing queries on our database. Or we could even have used both of these conditions since multiple criteria are allowed! Another method we can use is the findOne() method. This method works exactly like the find method except for one big difference. In fact, this method only returns the first document that matches the criteria specified. 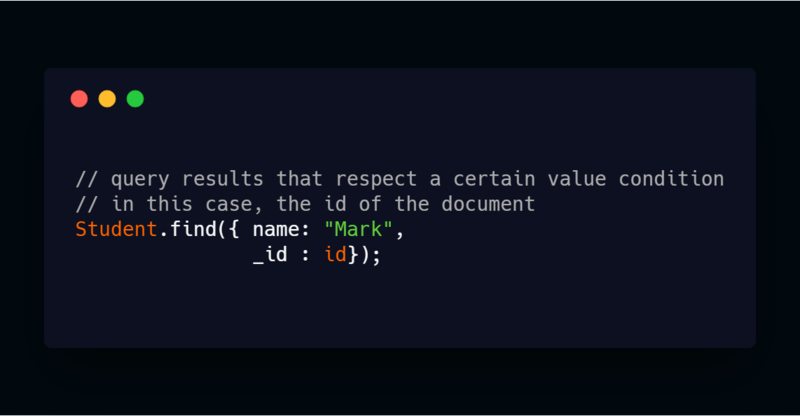 This means that if we wrote a query to find the user called “Mark” using the findOne() method, even if we had thousands of Mark users in our database we would only get the first one that matches the condition. This can be quite useful in situations where you don’t want to return too many data and slow down your operations. This method explains itself quite well just by reading the name. In this case, we only use one criterion: the id of the document we want to fetch. Since every document has a unique id, also this method will return a record. Up to this point, nothing should be new to you and you should be able to fully comprehend anything. 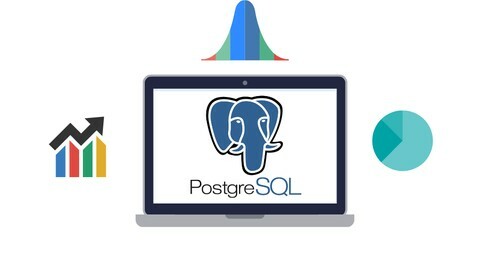 Here we are first using the beforeEach() function explained here to ensure that we will have some data inside of our database, then we are retrieving those data from it using the different methods explained earlier. Each of these tests will pass as we haven’t placed any assertion in our code, but the important part is to correctly analyze the output of the console logs and notice how the different results change. As you may have already noticed at this point, testing our applications can be quite a boring process due to having to restart our program each time we make a change to our code. Well, this behavior can be bypassed by using a very useful tool called: Nodemon. Instead of using mocha—watch we decided to use nodemon. This is somehow necessary since this command can cause problems when working together with mongoose. Inside of our test section inside the package.json file, we have replaced the old command with this new one. Basically, we are telling nodemon to execute the command “mocha -R min” whenever we make some changes to our files. Now, if you run the “npm run test” command inside of your project folder from the terminal, you will be able to see nodemon starting. Whenever you will make a change from now on you will see nodemon automatically restarting your tests. 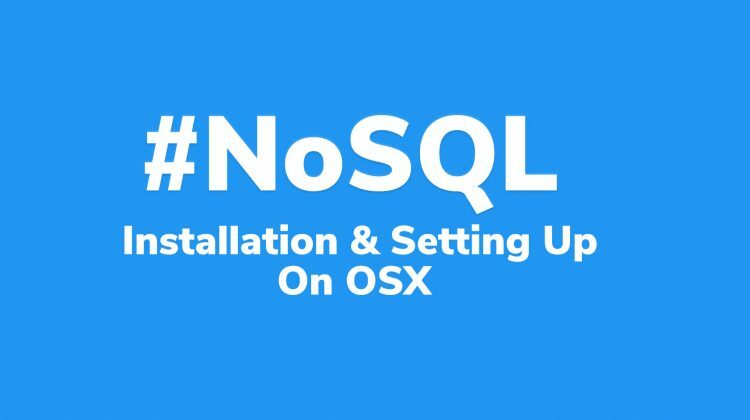 In this way, you will only have to run the testing command once and stop worrying about having to restart everything on every change you make. 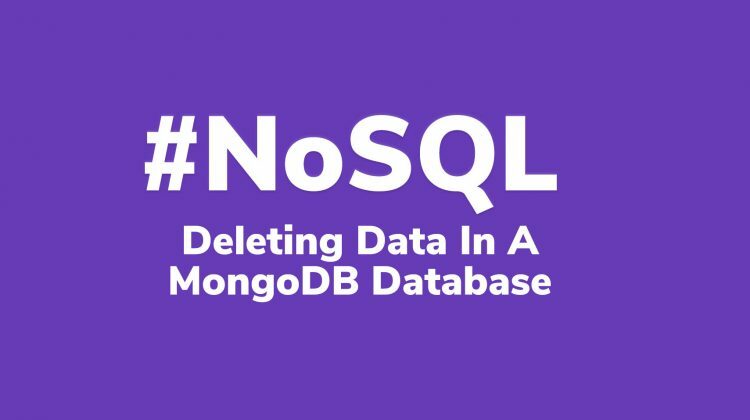 In this section, you have learned how to perform basic queries for retrieving data from a MongoDB database. In the next articles, we are going to learn how to perform other types of query and see them in action. 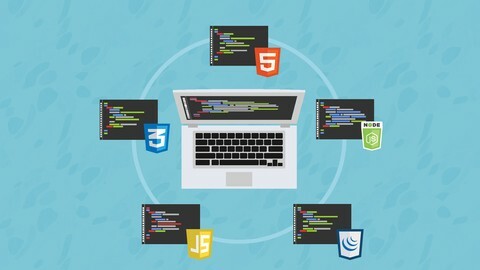 As always, keep in touch with me on twitter @BorrelliDev or check out my blog thecoderswag.com.